Packers C Jeff Saturday, who announced late last week he was retiring after the Pro Bowl, switched sides momentarily in Sunday’s all-star game in Hawaii to take one last snap with his longtime teammate, QB Peyton Manning. Saturday and Manning played a dozen years together as Indianapolis Colts and went to two Super Bowls together. According to Saturday, Manning orchestrated the switcheroo and tribute snap. Saturday played his final NFL season for the Packers in 2012 while Manning is now with the Denver Broncos. The NFC, coached by the Packers coaching staff, defeated the AFC, 62-35. 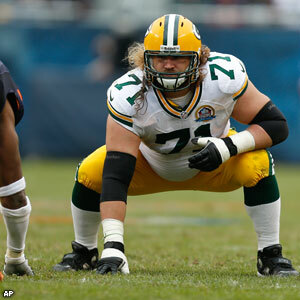 The only other Packers player to participate in the game was G Josh Sitton, who was appearing in his first Pro Bowl. Packers G Josh Sitton has been added to the NFC Pro Bowl roster. Sitton was a first alternate at guard, and he was named to the team on Sunday when the 49ers advanced to the Super Bowl. San Francisco G Mike Iupati — a Pro Bowl starter for the NFC — will not be participating in the all-star game. It’s the first Pro Bowl nod for Sitton, who has been an alternate in the past. The Packers coaching staff is coaching the NFC squad for the second straight year. The Pro Bowl is scheduled for Sunday, Jan. 27, in Hawaii. Sitton started every game at right guard for the Packers this past season — all 16 in the regular season and both playoff contests. For the second straight year, the Packers coaching staff will coach the NFC in the Pro Bowl. This year’s game will take place on Sunday, Jan. 27, at Aloha Stadium in Hawaii. Last year, the AFC beat the NFC, 59-41, after which Packers QB Aaron Rodgers criticized a lack of effort by players on both sides. The Packers coaching staff got the assignment by virtue of being the highest-seeded NFC team to lose in the divisional round of the playoffs. The Packers were the No. 3 seed. The top two seeds, Atlanta and San Francisco, are playing next weekend for the NFC Championship. Last year, the Packers were the NFC’s top seed but also lost in the divisional round. The Broncos were the AFC’s top seed this year but lost in double overtime last weekend, so Denver’s coaching staff, led by John Fox, will coach the AFC squad. This will be Mike McCarthy’s third time as the head coach of the NFC. He also coached the squad following the 2007 season, after the Packers lost in the NFC Championship. Back then, the Pro Bowl was played one week after the Super Bowl, and the coaching staffs of the teams that lost in the conference title games coached the Pro Bowl. Now, the game is played the week before the Super Bowl. The Packers have three players on this year’s NFC Pro Bowl roster — QB Aaron Rodgers, who is the starter, plus LB Clay Matthews and C Jeff Saturday. Other Packers still have a chance to make it as alternates because players from the teams participating in the Super Bowl do not go to the Pro Bowl, and others drop out for injuries and various additional reasons. G Josh Sitton is a first alternate, and San Francisco G Mike Iupati is the NFC starter at the position. If the 49ers reach the Super Bowl, Sitton will be added to the NFC roster. Packers KR Randall Cobb is also a first alternate, though Seattle’s Leon Washington was the NFC selection at that position and the Seahawks were eliminated this past weekend. Other Packers named alternates were FB John Kuhn, DL B.J. Raji, CB Tramon Williams and DB Charles Woodson. It’s election season in the NFL. Fans can begin voting to select players for the 2013 Pro Bowl, the NFL’s annual All-Star Game. Voting is available online here: http://www.packers.com/fan-zone/pro-bowl-ballot-2013.html. Balloting will conclude on Monday, December 17 following the conclusion of Monday Night Football (New York Jets at Tennessee Titans, ESPN, 7:30 pm (CT)). The teams will be announced at 6 pm (CT) Wednesday, December 26 on NFL Network. The 2013 Pro Bowl will be played on Sunday, January 27, 2013 and televised live on NBC at 6 pm (CT) from Aloha Stadium in Honolulu, Hawaii. The AFC and NFC All-Star squads are based on the consensus votes of fans, players and coaches. Each group’s vote counts one-third toward determining the 43-man rosters that represent the American Football Conference and National Football Conference in the Pro Bowl. NFL players and coaches will cast their votes on December 20-21. Packers QB Aaron Rodgers was the league’s top vote-getter last year, with 1,581,982 fan votes. QB Aaron Rodgers told Milwaukee radio station 540 ESPN that he plans to play in the Pro Bowl, for which he was voted the NFC starter. The Pro Bowl is slated for Jan. 29 in Honolulu. The Packers coaching staff will be coaching the NFC squad in Hawaii, with practices beginning next week. Other Packers named to the Pro Bowl squad were CB Charles Woodson, LB Clay Matthews, NT B.J. Raji, FB John Kuhn, C Scott Wells and WR Greg Jennings. Whether or not all of them will play isn’t known. Kuhn was injured in the NFC divisional playoff loss to the Giants. Along with Kuhn, Raji and Wells are first-time Pro Bowlers.